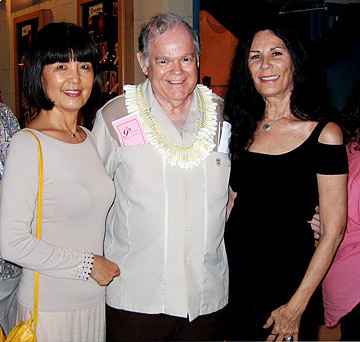 Director Randl Ask, center, was all smiles at the opening night party for "Pageant" at Manoa Valley Theatre last Wednesday. Keoki Kerr, left, starred as emcee Frankie Cavalier and Andrew Sakaguchi choreographed the show (see review here). 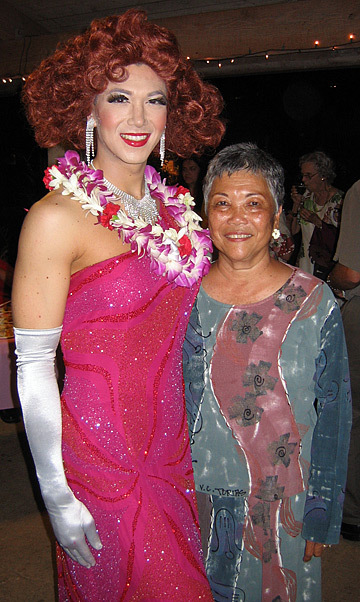 "Pageant" is Ask's last show in Hawaii as a performer or as a director; he returns to New York this fall. Don Richards was still in costume as Miss Texas when he came out after the show to greet the opening night audience and met retired Judge Marie Milks. The party food represented the regional cuisines of the contestants. The "Texas" table -- with shredded pork and barbeque sauce -- was one a favorite. 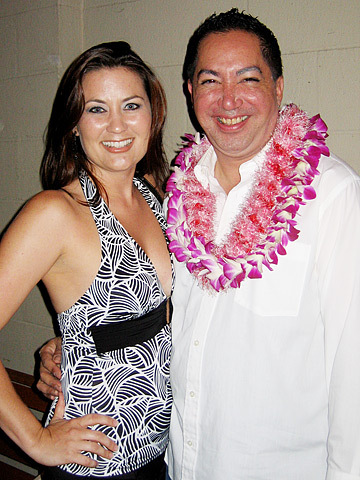 It was a big night for Michael K. Pa'ekukui, the only cast member from MVT's 1998 production of "Pageant" to "hana hou" as an actor in the 2006 version. Katherine Jones was one of the local theater celebrities who was in the audience to support the cast on opening night. "Pageant" costume designer Bill Doherty was congratulated by Mariko Lyons, left, and Margo Bourland on his creations for the MVT show. They'd worked with Doherty earlier this year as cast members in Jack Cione's "Mardi Gras Follies" at the Hawaii Theatre. Chad Kanui Lovell (Miss West Coast), left, Christopher Obenchain (Miss Great Plains) and Daniel James Kunkel (Miss Deep South) got out of their gowns in time to enjoy dessert. Kunkel said that shaving his head made it easier for him to wear a large wig. 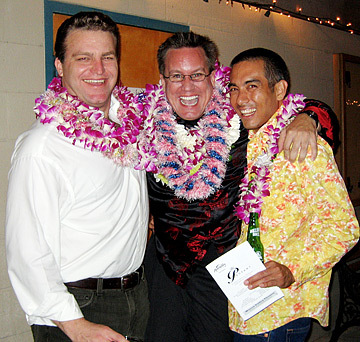 Richard Aadland, left, one of four MVT supporters who paid an extra $100 to be a pageant judge that night, displayed his souvenir judge's badge with an assist from Greg Howell, MJ Matsushita and Colin Miyamoto (Miss Bible Belt). The $100 surcharge is a new MVT fundraising project. Call 988-6131 to apply for judging duty.